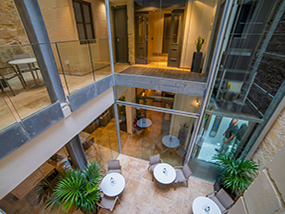 Enjoy a 4 night stay for 2 guests in a Mod Pod Room at 19 Rooms, an urban boutique hotel in the beautiful and historic city of Valletta in Malta. Stay is valued at approximately €520 EUR / £460 GBP / $590 USD*. Please note all additional purchases including meals, drinks, excursions etc. must be paid for by the winner separately. Please also note the winner and their guest will be required to pay the Environmental Fee of €0.50 per person, per night directly to the hotel. Auction stay dates: to be booked in advance and taken between: 03 November to 21 December 2019, 04 January to 15 March 2020, or 03 November to 21 December 2020, subject to availability. Luxury Travel Diary terms and conditions apply. *This auction item is valued at approximately €520 EUR by 19 Rooms, Valletta, Malta – please note this valuation is the list price provided to Luxury Travel Diary by the Auction Prize Provider and should be used as a guide only as cheaper discounted rates may be available. No cash alternative is available. This auction item excludes flights and transport – you will need to arrange your own flights / transportation to and from your home to 19 Rooms, Valletta, Malta to coincide with your booking. Your stay is subject to availability, must be booked in advance and taken between: 03 November to 21 December 2019, 04 January to 15 March 2020, or 03 November to 21 December 2020. Please also note the winner and their guest will be required to pay the Environmental Fee of €0.50 per person, per night directly to the hotel. Please note any associated taxes / resort fees / entrance fees etc. and additional purchases will be collected from the winner by the relevant property at the time of booking your stay or on departure and will not be deducted from the amount bid for the item. Winners must pay for their auction item in full via PayPal within 48 hours of the auction end. The full Terms of our auctions can be found here. To the fullest extent permitted by law, Luxury Travel Diary will not be liable for any loss or damage arising out of the winners’ use or enjoyment of the prize; and the winner acknowledges that Luxury Travel Diary accepts no responsibility whether directly or indirectly for any claims whatsoever arising in respect of the prizes provided by third party providers or sponsors.